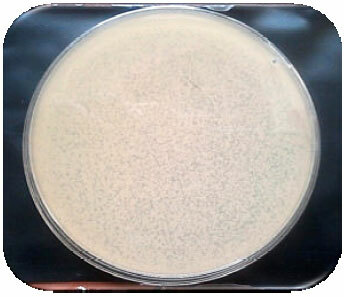 The production of the biocontrol agent, Bacillus thuringiensis (Bt) subsp. aegypti C18 (BtaC18), suffers huge economic losses due to phage infection. To improve it, an isolation and characterization of the causative agent are necessary, using gradient centrifugation, electron microscopy and protein analysis. Five morphologically distinctive phages were isolated from this strain belonged to the order Caudovirales. Moreover, they been classified: Tailed group (TP3-01, TP3-02, TP3-03 and TP3-05) and pseudotailed group (TP3-04) and fell into three families: Siphoviridae, Tectiviridae and Podoviridae. TP3-01 phage showed hexagonal head and slight long, non-contractile, relatively straight tail. TP3-02 has an isometric head with a long non-contractile, flexible tail while the morphologically similar TP3-03 has a slightly longer head and shorter tail. TP3-04 virus profile showed a rigid polyhedral protein capsid surrounded with a thick, flexible lipoprotein vesicle which sometimes became tail like tube, while TP3-05 has a rounded head and short non-contractile tail. These results suggest that TP3-01, TP302 and TP3-03 are members of the Siphoviridae family, TP3-04 belongs to Tectiviridae and TP3-05 is a member of Podoviridae. Protein banding analysis of the five phages revealed four major bands: 112.20, 70.79, 61.66, 50.12 and 39.81 kDa. The 112.20 kDa protein band does exist in all phages and it may represent the capsid protein. The other proteins are not universal and may be present in one phage and absent from another. In conclusion, BtaC18 was the host of at least five morphologically diversified phages which needs a lot of work to make a phage resistant bacterium. Y.A. Osman, A.A. El-Morsi , M.A. Elwakil and F.H. Omer, 2014. Five Distinctive Phages from an Egyptian Industrial Strain of Bacillus thuringiensis subsp. Aegypti. Journal of Environmental Science and Technology, 7: 67-75. The Gram positive entomopathogenic bacterium Bacillus thuringiensis (Bt), is a common soil microorganism that has been widely used for biocontrol of insect pests belong to the orders: Lepidoptera, Diptera and Coleoptera (Pang et al., 1998; Agaisse and Lereclus, 1995; Schnepf et al., 1998). Most of wild type strains of Bt are sensitive to phages and/or carry prophages either integrated into the bacterial genome or as a repressed plasmid. The prophages may be converted into a lytic phage causing host cell lyses under certain cultural conditions (Hendrix et al., 1999). It is reported that about 83% of Bt strains contain lysogenic phage (Ackermann et al., 1994) and during their fermentation, lysogenic phages might cause failure in 15-30% of the batches, resulting in severe economic losses (Liao et al., 2008). Characterization of phages depended mainly on their morphology but the introduction of the negative staining in (1959) had facilitated their studies; especially when examined microscopically. According to Ackermann (2007), 96% of the virus particles appeared to be tailed and they constitute the order Caudovirales and about 3.7-4.0% are recorded as polyhedral, filamentous, or pleomorphic. The tailed viruses are extremely large group and characterized by having diverse genomes, virion and replication patterns (Fauquet et al., 2005). Caudovirales, one of the largest orders of the tailed viruses, consisted of three families (Myoviridae, Podoviridae and Siphoviridae) where their structural tails are unique and have large implication on taxonomic properties of these bacteriophages. This order harbors more than 350 species of bacteriophages with homologous genes which perform similar function. However, their nucleotide sequences can vary significantly but still believe they have the same origin. Myoviruses is the largest among the tailed viruses (~25%) which include the largest and most complex tailed bacteriophages. For example, the Myoviridae or contractile tailed bacteriophage; is one of the families where the virus consisted of a head and a tail separated by a neck. The tail has a contractile sheath, a central tube and an adsorption apparatus. The Siphoviridae has long simpler, noncontractile tails with either a rigid or flexible tubes. However, Siphoviruses are the most abundant tailed phages (61% of tailed viruses). The Podoviridae, the third family of the caudivirales, characterized by short noncontractile tails and consisted about 14% of the members of this order (Fauquet et al., 2005; Ackermann, 2009). The importance of viruses has been recognized by the industrial and scientific community. Viruses have been used academically for bacterial typing or identification and recently, they been recognized to control pathogenic bacteria in food chain. Accordingly, the isolation, characterization and identification of viruses infecting industrial strains of bacteria is central to any industrial process (Ackermann et al., 1995; Rosovitz and Leppla, 2000). The phages infecting Bt were not always from one morphogroup and this constitutes a challenge to the industrial people. Therefore, isolation, purification and identification of the phages represent a step forward in controlling the economic damages to the biopesticide industry. The objective of this study was designed to characterize the five different phages attacking the industrial Egyptian isolate of Bt; the BtaC18; under laboratories condition. Bacterial strains: There were two types of Bt wild type strains used in this study, 1-phage sensitive strain (BtaC18) which was used for phage isolation and propagation and 2-phage-sensitive strain (tolworthi) which has been used as hosts for phage senstivity assays (Osman and Madkour, 1999). Bacterial propagation: The selected Bacillus thuringiensis (Bt) strains used in this research were inoculated in Luria Bertani (LB) media, containing: Peptone 10 gm L-1, yeast extract 5 g L-1 and sodium chloride 10 g L-1. The inoculated media were shacked at 250 rpm and 30°C for 24 h. For sporulation, the Bt strains were grown in T3 medium containing: Peptone (5 g L-1), yeast extract (1.5 g L-1), MnCl2 (0.5 m L-1), sodium phosphate buffer (50 mM) and was adjusted to pH 6.8). The cultures were shacked for 72-96 h at 250 rpm and 30°C as described by Osman and Madkour (1999). Preparation of phage-free-Bt strain: Forty five strains of the wild types Bt were cultured on LB broth and detected for viral infection; lysis. Each lytic resistant strain was cultured again in T3 broth media, incubated at 30°C on a rotatory shaker for 72 h until complete sporulation. To get rid of all potential prophages, sporulated cells were boiled for 30 min and recultured on LB broth. The sporulation was detected by endospore stain and examined microscopically. Phage isolation and propagation: Isolation of bacteriophages were carried out from wild-type Bt aC 18 (phage-sensitive) according to the methods of Lu et al. (2003) and Carey-Smith et al. (2006) with slight modification. The bacterium was grown in 5 mL LB broth at 30°C for 24 h on a rotatory shaker (250 rpm). A pure phage stock was obtained by adding 0.25 mL of chloroform to each 5 mL of bacterial lysate and the supernatant containing the virus was collected by centrifugation at 5,000 rpm for 13 min. The viral solution was further purified from any bacterial remains by filtrations (0.45 μm), then the viral stock was kept at 4°C for subsequent experiments. Phage detection: Bacterial sensitivity to the phage infection was carried out by observing bacterial lyses at the spot where the phage was deposited on the bacterial lawn as reported by Chang et al. (2005). Phages concentration: The phages containing supernatant were concentrated according to the method of Gill and Abedon (2003). The filtrate was separated and centrifuged at high speed of 16000 rpm for 90 min at 5°C, the pellets were resuspended in SM buffer using sterile Eppendorf tubes. Precipitation of phages using polyethyleneglycol (PEG8000): The concentrated phages were precipitated using the method of Yamamoto et al. (1970) and Sambrook et al. (1989) while some modifications were done. A 7.5 mL of phage was added to 1.8 mL of PEG 8000 in a sterile test tube, incubated in ice for 2 h, then centrifuged at 16000 rpm for 30 min at 4°C, respin 2-3x to remove all of PEG solution (using a micro-pipet tip facilitates removal of all solution). Resuspend phages in SM buffer (250 μL) mixed well then transfer to eppendorf tubes and centrifuged at (13000 rpm for 15 min), the supernatants were transferred to new eppendorf tubes and kept for further studies. Separation of precipitated phages: A half gram of solid CsCl was added to 1 mL of purified phage suspension, inverted gently until they completely dissolved, then stored in ice. A series of CsCl gradients were used to separate the phages; these were 1.15, 1.35, 1.55 and 1.70 g mL-1 of SM buffer. One milliliter of each phage stock was pipetted onto the top layers of the CsCl layers and centrifuged at 45,000 rpm at 4°C for overnight (XL-90 Ultracentrifuge, Beckman). When the centrifugation was completed, the phage particles (bands) were collected using a hypodermic needle (18 gauge). The CsCl was removed by dialysis against phosphate buffer saline (pH 7.0) and the purfied phages were stored at 4°C (Sambrook et al., 1989). 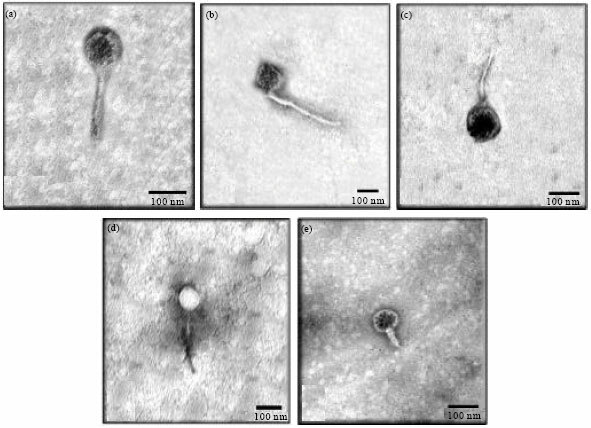 Morphological characteristics of the isolated phages: Morphological assessments of the isolated phages were examined under a Transmission Electron Microscope (TEM). A drop of purified phage particles (about 1012) were spotted on carbon film picked up on copper grids and then the phage particles were negatively stained with 2% (w/v) uranyl-acetate. After 1 min the excess liquid was removed with a filter paper. The grids were air dried for about 5 min. Phage morphology was examined and photographed with TEM (JEOL JEM 1010 at Regional Centre of Mycology and Biotechnology, Al-Azhar University, Cairo, Egypt). Analysis of phages proteins: Purified phage suspensions were precipitated in 4 volumes of ice- cold acetone. After a centrifugation at 10000 rpm, 10 min, 4°C, the pellet was air-dried and resuspended in PBS buffer. Phage structural proteins were analyzed by sodium dodecyl sulfate-polyacrylamide gel electrophoresis (SDS-PAGE) (Laemmli, 1970). Screening of several strains of a local collection of wild type Bt revealed that the cultural techniques induced complete cell lyses of some strains after 24 h these strains especially BtaC18 was used for phage propagation. An authentic strain was used to test the phage sensitivity assay; Bt subsp. tolworthi. The filtrates of BtaC18 were found to produce prominent clear spot by the drop test and cause numerously irregular plaques differ in their transparency on the bacterial lawn by the double layer agar plaque method (Fig. 1). The culture filtrates of the BtaC18 revealed the presence of five different morphotypes of phages as judged from transmission electron micrographs which named: TP3-01, TP302, TP3-03, TP3-04 and TP3-05 (Fig. 2a-e). TP3-01 was fairly small phage with hexagonal head of 103.33 nm diameters and slight long, non-contractile, relatively straight tail of 183.33 and 23.33 nm diameters. TP3-02 showed that isometric head of 111.11 nm with a long non-contractile, flexible tail of 388.88 nm length and 17.7 nm wide. TP3-03 appear to be similar TP3-02 morphologically with dimensions 113.04 nm for head and 188.5x8.3 nm for tail. The TP3-04 showed a rigid polyhedral protein capsid (93.3 nm) surrounded with a thick, flexible lipoprotein vesicle which sometimes became tail like tube while TP3-05 was observed as rounded head of 80.0 nm and short non-contractile tail of 53.3x20.0 nm (Fig. 2). The general morphology of the five TP3-phages is summarized in Table 1. 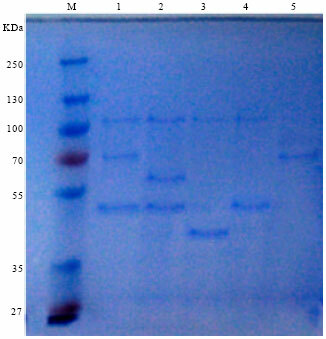 Total protein analysis of the purified phage particles was performed using denatured polyacylamide gel, SDS-PAGE electrophoresis (Fig. 3). A total of five protein bands were observed in the gel, with the molecular weights of 112.20, 70.79, 61.66, 50.12 and 39.81 KDa (Table 2). The major proteins of the five phages showed different degrees of similarities but not identical. A 112.2 KDa protein appeared to be highly conserved between all phages, a sub-major protein was 50.12 KDa, present in three of the five phages: TP301, TP3-02 and TP3-04. The highest degree of similarity was observed between phages TP301 and TP3-02. The phage protein profiles also showed two sub-minor proteins with no particular similarity between the phages. Particles with a tail-like: TP3-05 had rounded head of 80.0 nm and short non-contractile tail of 53.3x20.0 nm, Podoviridae family (X-70000). The number of distinctive phages isolated from BtaC18, in this study, emphasized the urgency for a smart development program of the industrial strain to continue its effectiveness as a bioinsectcide. Previous studies have shown that the bacteriophages associated with this particular bacterium could be the main factor for the troubles associated with the manufacturing process (Al-Heeti and Osman, 2008; Osman et al., 2013). Electron microscopy photos demonstrated not only the different phages parasitize on the BtaC18 but also their morphological diversities. Dependence on the morphology of phages, a widely used system to classify phages (Bradley, 1967; Ackermann, 2007), is probably one of the most prominent criteria in this field (Yoon et al., 2007). Accordingly, the five phages isolated during this study were found to belong to the order Caudovirales. However, four of them (TP3-01, TP3-02, TP-03 and TP-05) are tailed and one (TP-04) has pseudo-tail. Therefore, they were further classified as members of families: Siphoviridae, Tectiviridae and Podoviridiae; based on the system of Bradley (1967) and Ackermann (2007). The phages TP3-01, TP3-02 and TP3-03 of hexagonal head and long flexible, non-contractile tails are considered as members of the family Siphoviridae or Bradleys group B1. These phages were similar to phages TP-16c, TP-17c and TP-19c of Reynolds et al. (1988); MZTP02 of Liao et al. (2008) and BtCS33 of Yuan et al. (2012). While, TP3-04 has a rigid polyhedral capsid with a thick, flexible lipoprotein vesicle and sometimes became tail like tube, so far the authors considered it in the family Tectiviridae (Bradleys group D4). These above results are in agreement with the finding of Ackermann et al. (1978) and Verheust et al. (2005); for phage Bam35 and GIL16, respectively. On the other hand, the phage TP3-05 which has a rounded head and a short non-contractile tail is typically similar to the members of family Podovoridae or Bradleys group C1. These results are in agreement with Ito (1978) for phi 29 phage. Overall, about 96% of all phages reported in the literature were tailed and belonged to the three major families: The Myoviridae (24.5%), Siphoviridae (61%) and Podoviridae (14%) (Ackermann, 2007). Therefore, It was not surprising to find that four of the isolated phages (80%) belonged to these morphological families. The phage protein patterns supported the notion of diversity among the phages isolated from the local strain of Bt; BtaC18. The numerous viruses feast on the same bacterial reflects the dynamics between the host and the parasite. Meaning the bacterial tries to escape the viral infection by changing its receptors, a new modified viruses interacts with the newly evolved surface protein. Dependence on the electrophoretic profiles of the viral structural proteins for phages differentiation and characterization is an established procedure (Stewart et al., 1985; Coveney et al., 1987). In this study, the protein banding pattern showed two main clusters: Cluster one contains TP3-01, TP3-02 and TP3-05; while cluster two includes TP3-03 and TP3-04. This grouping is slightly different from the straightforward morphological data, where, TP3-5 is placed in a separate group, pseudotailed one. Moreover, TP3-01, TP3-02 and TP3-03 were placed in the family Siphoviridae, TP3-05 belonged to the family Podoviridae and TP3-04 is included in families Tectiviridae, respectively. This apparent discrepancy between the morphological and protein data is understandable because of the rapid mutation trends seen in viruses (Osman et al., 2013). Moreover, possessing protein with the same the molecular weights is not necessarily for the same protein but the function and the amino acid sequences of the same molecular weight protein band could be totally different. Therefore, further consideration should be taken and more characters needed for accurate and definitive differentiations between the closely related phages as suggested by Osman et al. (2013), Grimont et al. (1978) and Loessner et al. (1993). In conclusion, BtaC18 was the host of at least five morphologically diversified phages which needs a lot of work to make a phage resistant bacterium. Especially, if this bacterium is already industrial strain such as BtaC18. Ackermann, H.W., 2007. 5500 phages examined in the electron microscope. Arch. Virol., 152: 227-243. Ackermann, H.W., 2009. Phage Classification and Characterization. In: Bacteriophages: Methods and Protocols, Volume 1: Isolation, Characterization and Interactions, Clokie, M.R.J. and A.M. Kropinski (Eds.). Chapter 13, Humana Press, New York, USA., ISBN-13: 9781588296825, pp: 127-140. Ackermann, H.W., R. Roy, M. Martin, M.R.V. Murthy and W.A. Smirnoff, 1978. Partial characterization of a cubic Bacillus phage. Can. J. Microbiol., 24: 986-993. Ackermann, H.W., R.R. Azizbekyan, H.P.E. Konjin, M.M. Lecadet, L. Seldin and M.X. Yu, 1994. New Bacillus bacteriophage species. Arch. Virol., 135: 333-344. Ackermann, H.W., R.R. Azizbekyan, R.L. Bernier, H. de Barjac, S. Saindoux, J.R. Valero and M.X. Yu, 1995. Phage typing of Bacillus subtilis and B. thuringiensis. Res. Microbiol., 146: 643-657. Agaisse, H. and D. Lereclus, 1995. How does Bacillus thuringiensis produce so much insecticidal crystal protein? J. Bacteriol., 177: 6027-6032. Al-Heeti, A. and Y.A. Osman, 2008. Biological pest control: Advantages and challenges in the Arab world. J. Arab Org. Agric. Invet. Dev., 20: 31-42. Bradley, D.E., 1967. Ultrastructure of bacteriophage and bacteriocins. Bacteriol. Rev., 31: 230-314. Carey-Smith, G.V., C. Billington, A.J. Cornelius, J.A. Hudson and J.A. Heinemann, 2006. Isolation and characterization of bacteriophages infecting Salmonella spp. FEMS Microbiol. Lett., 258: 182-186. Chang, H.C., C.R. Chen, J.W. Lin, G.H. Shen, K.M. Chang, Y.H. Tseng and S.F. Weng, 2005. Isolation and characterization of novel giant Stenotrophomonas maltophilia phage phiSMA5. Applied Environ. Microbiol., 71: 1387-1393. Coveney, J.A., G.F. Fitzgerald and C. Daly, 1987. Detailed characterization and comparison of four lactic streptococcal bacteriophages based on morphology, restriction mapping, DNA homology and structural protein analysis. Applied Environ. Microbiol., 53: 1439-1447. Fauquet, M., M.A. Mayo, J. Maniloff, U. Desselberger and L.A. Ball, 2005. Virus Taxonomy: VIIIth report of the International Committee on Taxonomy of Viruses. Elsevier Academic Press, San Diego, CA., USA., ISBN-13: 9780080575483, Pages: 1162. Gill, J. and S.T. Abedon, 2003. Bacteriophage ecology and plants. APSnet Feature. http://www.apsnet.org/publications/apsnetfeatures/Documents/2003/BacteriophageEcology.pdf. Grimont, F., P.A.D. Grimont and P. du Pasquier, 1978. Morphological study of five bacteriophages of yellow-pigmented enterobacteria. Curr. Microbiol., 1: 37-40. Hendrix, R.W., M.C.M. Smith, R.N. Burns, M.E. Ford and G.F. Hatfull, 1999. Evolutionary relationships among diverse bacteriophages and prophages: All the world's a phage. Proc. Natl. Acad. Sci. 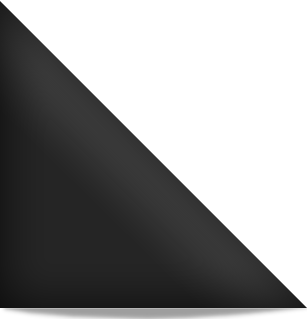 USA., 96: 2192-2197. Ito, J., 1978. Bacteriophage phi29 terminal protein: Its association with the 5' termini of the phi29 genome. J. Virol., 28: 895-904. Liao, W., S. Song, F. Sun, Y. Jia, W. Zeng and Y. Pang, 2008. Isolation, characterization and genome sequencing of phage MZTP02 from Bacillus thuringiensis MZ1. Arch. Virol., 153: 1855-1865. Loessner, M.J., E. Neugirg, R. Zink and S. Scherer, 1993. Isolation, classification and molecular characterization of bacteriophages for Enterobacter species. J. Gen. Microbiol., 139: 2627-2633. Lu, Z., F. Breidt Jr., H.P. Fleming, E. Altermann and T.R. Klaenhammer, 2003. Isolation and characterization of a Lactobacillus plantarum bacteriophage, ΦJL-1, from a cucumber fermentation. Int. J. Food Microbiol., 84: 225-235. Osman, Y.A. and M.A. Madkour, 1999. Discovery and development of a unique new Bacillus thuringiensis subsp. Aegypti to control agricultural pests. Arab. Agric. Res. J., 4: 1-15. Osman, Y.A., A.H. Mohamedin and R.E. Elkafrawy, 2013. Molecular characterization of Bacillus thuringiensis mutant resistant to bacteriophage. Egypt. J. Pest Control, 23: 110-123. Pang, Y., J.Z. Bao and D.X. Gu, 1998. Biological Control in China. Shanxi Science and Technology Press, Taiyuan, China, pp: 368-494. Reynolds, R.B., A. Reddy and C.B. Thorne, 1988. Five unique temperate phages from a polylysogenic strain of Bacillus thuringiensis Subsp. aizawai. Microbiology, 134: 1577-1585. Rosovitz, M.J. and S.H. Leppla, 2000. Medicine: Virus deals anthrax a killer blow. Nature, 418: 825-826. Sambrook, J., E.F. Fritish and T. Maniatis, 1989. Molecular Cloning: A Laboratory Manual. 2nd Edn., Cold Spring Harbor Laboratory Press, New York, USA., ISBN-13: 978-0879693091, Pages: 397. Stewart, P.R., H.G. Waldron, J.S. Lee and P.R. Matthews, 1985. Molecular relationships among serogroup B bacteriophages of Staphylococcus aureus. J. Virol., 55: 111-116. Verheust, C., N. Fornelos and J. Mahillon, 2005. GIL16, a new gram-positive tectiviral phage related to the Bacillus thuringiensis GIL01 and the Bacillus cereus pBClin15 elements. J. Bacteriol., 187: 1966-1973. Wiseman, R.L. and L.A. Day, 1977. Different packaging of DNA in the filamentous viruses Pf1 and Xf. J. Mol. Biol., 116: 607-611. Yamamoto, K.R., B.M. Alberts, R. Benzinger, L. Lawhorne and G. Treiber, 1970. Rapid bacteriophage sedimentation in the presence of polyethylene glycol and its application to large-scale virus purification. Virology, 40: 734-744. Yoon, S.S., R. Barrangou-Poueys, F. Breidt Jr. and H.P. Fleming, 2007. Detection and characterization of a lytic Pediococcus bacteriophage from the fermenting cucumber brine. J. Microbiol. Biotechnol., 17: 262-270.